WITH ITS DARK GREEN MERCEDES, GLENN GOULD RECORDS, AND SPARE BUT IMPOSING FURNITURE, THOMAS BERNHARD’S HOUSE IN UPPER AUSTRIA IS A CREATION AS DELIBERATE AND PUBLIC AS ANY OF HIS NOVELS OR PLAYS. Take good care, Gambetti, not to visit the places associated with writers, poets and philosophers, because if you do you won’t understand them at all. I had planned our excursion to Das Bernhard-Haus, the Thomas Bernhard house, near the village of Ohlsdorf in Upper Austria, with embarrassment. It was just the kind of admiration behavior, I thought, that Bernhard himself would have found shameless: traipsing from room to room around an author’s house that has been turned into a kitschy museum, looking at the author’s possessions inside the author’s house; worst of all, to perhaps stare at the author’s typewriter on the author’s desk. One would hope to be above supposing that it was anything but spying, to seek to learn anything about a writer by gawking at his kitchen or bedroom. The greatness of Bernhard’s novels and memoirs is, after all, philosophical, and stylistic. A brutally simple and apparently universal idea—Everything is ridiculous when one thinks of death, he said upon receiving Austria’s Förderungspreis für Literature in 1968—is embroidered into a vivacious comedy of pure thought, through compulsive repetition, confident self-contradiction, and heady exaggeration. It is, I thought, art to be contended with on its own terms—in the echo chamber of the solitary mind, not on the guided tour. 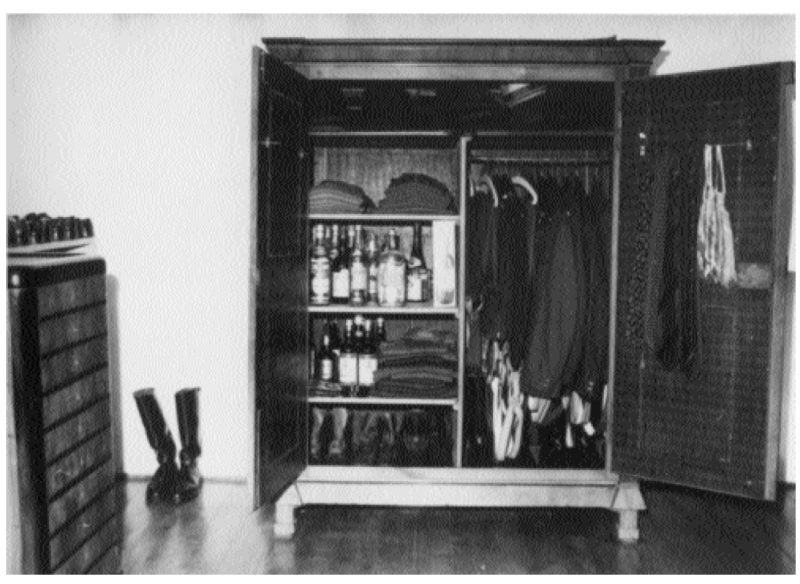 Upstairs in Thomas Bernhard’s Obernathal house, an armoire contains liquors for entirely hypothetical guests, and gear for hunting, which he abhorred. Real intellect does not know admiration.… People enter every church and every museum as though with a rucksack full of admiration, and for that reason they always have that revolting stooping way of walking which they all have in churches and museums, he said. I have never yet seen a person enter a church or a museum entirely normally, and the most distasteful thing is to watch those people in Knossos or in Agrigento, when they have arrived at the destination of their admiration journey, because the journeys these people take are nothing but admiration journeys. But while contemplating a trip to Austria last summer, I learned that Bernhard’s 1963 debut novel, Frost, was soon to appear in English for the first time. I pulled down the books that sat together on my shelf, years after I had figured, with some sadness, that I had read all the Bernhard prose there was to read, at least without rectifying my inability to read German. I recalled their archetypal settings: decrepit ancestral estates amid unfathomable forests; river gorges that roar unrelentingly; valley hamlets populated by the crippled human products of the stultifying Austrian state. On the map all around Ohlsdorf were the unsettling place-names that ring through Bernhard’s novels: Wolfsegg, Eferding, the Aurach gorge, Attnang, Altensam, Traich, Altmünster, Ottnang, the Kobernausser forest, Wels, Weng. Not distinctive settings, but points of obsessed reference: mentioned incessantly, but never described. I write only of interior landscapes, and the majority of people don’t see those: they see almost nothing that is “inside.” Because they always think that if something is internal, it’s obscure, and therefore they don’t see anything. I think I’ve never described a landscape in a book. I treat only concepts, by which I mean talking always of mountains or a city or roads, but how these appear—no, I have never described a landscape. I decided that it would be worth seeing those mountains, towns, and roads, for if nothing else they invariably encircle, even strangle, Bernhard’s interior landscape. And so I found myself waiting on the Obernathal road to meet Dr. Peter Fabjan, who as Bernhard’s younger half-brother is a living character from the life that was the constant template for Bernhard’s effort to overcome the enormity of existence. For in his fiction he drew blatantly on his own factual circumstances, while in his five concentrated memoirs, published together in English as Gathering Evidence, he blatantly fabulized his childhood as he chose to present it. Whatever is communicated can only be falsehood and falsification; hence it is only falsehoods and falsifications that are communicated. The aspiration for truth, like every other aspiration, is the quickest way to arrive at falsehoods and falsifications with regard to any state of affairs. And to write about a period of one’s life, no matter how remote or how recent, no matter how long or how short, means accumulating hundreds and thousands and millions of falsehoods and falsifications, all of which are familiar to the writer describing the period as truths and nothing but truths. On that silent summer morning, a taxi dropped us at a farmhouse, its stone walls dotted with small, square windows. The sun shone on fields punctuated by patches of forest, tall Norwegian spruce with spindly trunks. A cabinet mounted on a post by the road advertised a small book about Bernhard by a neighbor, along with homemade cider and liquor. But the stillness and the thick-walled houses made it difficult to contemplate knocking on doors in inquiry. Rounding the Bernhard-Haus, which looked like a small fortress, we found an open doorway, enlivened by the movements of an ancient woman who was washing the floor. She shooed us away ferociously. We wandered along the road a short way in each direction, and then waited on a bench near a tangle of blackberry bushes. Eventually a Jaguar crunched up the gravel from the other side of the house. Dr. Fabjan bade us wait, and soon returned with his wife, Anny, to show us in. 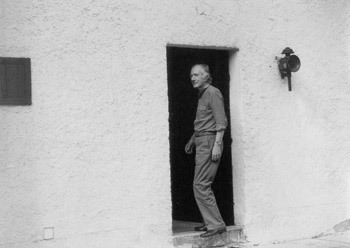 Bernhard, upon attaining definitive success with Frost and his subsequent novella Amras, bought the Obernathal farmhouse, then in a ruinous state, in 1965. It dates, in parts, to the fifteenth century, and Bernhard, in acquiring it, gained the official identity of Bauer zu Nathal, “farmer at Nathal.” The widow of the previous Bauer continued to live there for some years, but Bernhard walled off her room’s internal communication with the rest of the house—because, Dr. Fabjan said, her pleasant company distracted him from writing. Right from the beginning I isolated myself far too much in Nathal and not only did nothing to counter this isolation but actually promoted it, consciously or unconsciously, to the point of utter despair.… On the other hand, after a few days in Vienna I have to flee to Nathal to avoid suffocating in the loathsome Viennese air.… Every other week I flee from Nathal to Vienna and then from Vienna to Nathal, with the result that I have become a restless character who is driven back and forth between Vienna and Nathal in order to survive. Dr. Fabjan brought us into the author’s house and before I knew it, I was looking at the author’s bicycle, complete with a little sign. The sign indicated that the bike had belonged to Bernhard’s stepfather, Dr. Fabjan’s father, whom the illegitimate Bernhard insisted on referring to only as his guardian. It was a sturdy black cruiser made in the ’30s, and, standing there riderless as Dr. Fabjan reminisced, it was a moving sight. Apologizing unnecessarily for his faulty English, Dr. Fabjan explained that this room had originally been a cow-stall, referring to a scribbled list of English words. 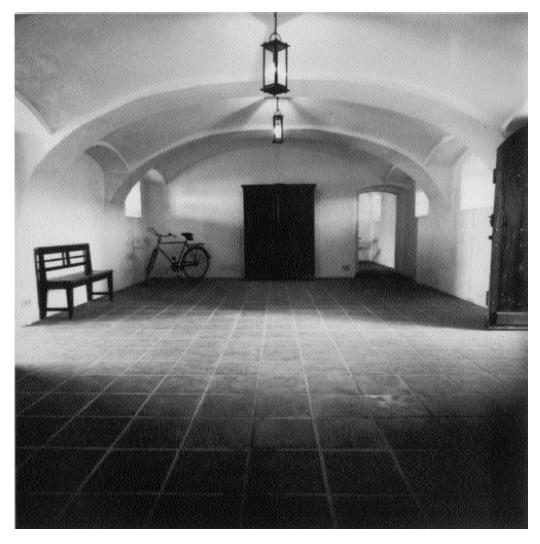 They were architectural and agricultural terms indicating the original functions of the rooms, such as hay-loft and pig-sty and cow-stall, and features important to Bernhard, such as vault: Dr. Fabjan said that his brother considered the vaulted ceilings found on the ground floor, as they are in most old buildings in Austria, particularly appealing. Bernhard renovated, and occupied, the house’s many rooms sequentially over the next fifteen years, overseeing and participating in the restoration as long as his health, compromised by severe lung ailments, permitted. He would work on a new room when he found himself unable to write, Dr. Fabjan said. From one room to another, a few simple elements are repeated and combined anew, rather like the restless pattern of restatement in the sentences of his unparagraphed prose. The thick walls are invariably whitewashed, with plain iron fixtures. Contrasting with the walls is the dark color of the doors and trim: Dr. Fabjan explained that the writer himself achieved this by mixing black and bright green paints himself, to varying effect. Sometimes the color is visibly green, but sometimes, like the stands of spruce in the distance, it seemed to be black until the sun shone on it directly, as it did that day, revealing its green tinge. The front is more austere than any other I know in Austria, and more elegant. In the middle is the main entrance, twenty-five feet high, painted in such a dark shade of green that it appears black, with no ornamentation except for the brass knob, which is screwed on and never polished, and an iron bell pull to the left…. I don’t know a more beautiful hall, I told Gambetti. It’s imposing by its size and by its absolute severity. There’s not the slightest decoration on the walls, no pictures, nothing. The walls are whitewashed and give an impression of uncompromised austerity. Dark green is also the color of the lamp shades, curtains, upholstery, and objects like clocks, and of the oblong tile stoves that heat its rooms. One stove, Dr. Fabjan said, had been original to the house; his brother had the others replicated to match it exactly. Thomas Bernhard’s Mercedes-Benz is also dark green, and was parked alongside a dark green Suzuki Samurai that bore a sign in its windshield saying, basically, Thomas Bernhard’s Suzuki Samurai. Most of the furniture, bought at nearby estate sales, is wooden, and sparely distributed, giving each piece, whether rough or grand, an air of importance. Downstairs, rustic tables and chairs typify the rural Austrian culture that Bernhard reviled as deadly but that was integral to the dilemma of his own existence. He could no more escape it than he could escape himself, given his mission to submit myself to a full investigation. Elsewhere, Biedermeier and Josephine pieces—of course a little bright for Bernhard’s taste, Dr. Fabjan said—represent Austria’s grandiose cultural patrimony, equally risible to Bernhard, and equally inescapable. (Bernhard himself also designed thickly geometrical pieces of furniture, reminiscent of Werkstätte-era Viennese design, gently mocked in Old Masters.) Hung on the walls are heirlooms of Bernhard’s despised Austrian state—imperial edicts issued by Maria Theresa—along with medieval memento mori woodcuts. The Catholic Habsburgs never cared much more for painting than they did for literature, because painting and literature always seemed to them dangerous arts, unlike music, which could never become dangerous to them and which the Catholic Habsburgs, just because they were so brainless, allowed to unfold to full flower, as I once read in a so-called art book. Habsburg falseness, Habsburg feeble-mindedness, Habsburg perversity in matters of faith, these are what you see hanging on all these walls. Dr. Fabjan referred, in summary, to the house’s strong style. His English had an accuracy that echoed the decorous bluntness of his brother’s writing. The Obernathal house is like an idea, he said, with perfect simplicity; his brother liked to invent places. It was impossible not to think of Wolfsegg, the hated family estate to which, in Extinction, Maurau must return from Rome as unwilling heir after the death of his parents in a road accident; and also of Concrete’s Peiskam, the isolated rural home that Rudolf blames, among innumerable other things, for his inability to write the first sentence of his long-planned monograph on Mendelssohn. But Bernhard’s deliberate transformation of the Obernathal property into an ideal building most obviously echoes Correction, and Roithamer, the Wittgenstein-like character whose quest to construct a perfect cone-shaped house in the forest for his sister leads to her destruction, and his suicide. Correction is the ultimate Bernhard novel, culminating his identification of creation with endlessly revising and discarding to the point of nothingness—a nothingness itself contradicted by a tremendous something: Correction itself. Not only did I design this Cone, he could say to himself, a thought which enabled him time and again to surmount the many setbacks, the sheer impossibilities that rose every year to obstruct his work, his research on the Cone, not only did I design the Cone, and I know that no one else in the world has to this day even designed such a cone, such a cone has never yet existed even in the form of a sketch, so enormous a cone, a cone of such monstrous size and so habitable, in so unique a natural setting as this natural setting in the midst of the Kobernausser forest; not only did I design such a cone, I’ve actually built this cone and everyone can see that I’ve built this Cone, so Roithamer wrote. When Bernhard did come to Obernathal, he did so almost always alone, according to Dr. Fabjan. There was thus no real use for the formal dining room and the numerous sitting rooms and multiple bedrooms appointed as if for an entire family and guests. Most rooms have elegant trays with bottles of sherry or vermouth, brought back from the sojourns in Spain or Italy on which Bernhard actually did much of his writing. Bernhard himself was not a drinker, his brother explained, but placed the best brands of sherry and vermouth in every room. He hated hunting and hunters. Yet an armoire at the top of a landing is stocked on one side with sherries and vermouths, and on the other with a hunter’s wardrobe, numerous identical dark green sweaters, jackets, and trousers. In case of a World War III, Dr. Fabjan said. Not to mention Bernhard’s prodigious supply of shoes. Thomas’s shoe tic, his brother said. Bernhard hung a rifle from the curtain rod of his bedroom. Of course this was—nur Schmuck, just decoration, his brother made clear. He was afraid of this instrument! Every sitting or living or sleeping room has a record player. The 1981 CBS Masterworks recording of the Goldberg Variations played by Glenn Gould sits predictably, but thrillingly, on top of a couple of other LPs in a sitting room. It is virtually a staging of the end of The Loser, in which Bernhard endowed a fictional version of the misanthropic pianist with his own autobiographical traits: I asked Franz to leave me alone in Wertheimer’s room for a while and put on Glenn’s Goldberg Variations, which I had seen lying on Wertheimer’s record player, which was still open. Dr. Fabjan blasted a bit of Brahms from another room, while noting that his brother did not love only classical music: he was astonished, he said, to hear him declare that he liked Prince. I have repeated this little fact often, and it was later suggested to me that this detail, like the inevitable Glenn Gould record, was likely an artful bit of image-management by Dr. Fabjan. But the entire Obernathal house, the Obernathal idea, is stage-managed not by Dr. Fabjan but by Bernhard. We were not snooping brainlessly into his bedroom or kitchen but viewing a creation as deliberate and public as any of his novels or plays. Bernhard’s quasi-autobiographical novels, his so-called novels, mirror his semi-invented memoirs, his so-called memoirs; Obernathal, his so-called farmer’s house, his so-called author’s house, is likewise a true fiction that reflects the fictionalized truth of The Loser or Correction. The truth is that I have always hated the Viennese coffeehouses because in them I am always confronted with people like myself, and naturally I do not wish to be everlastingly confronted with people like myself, and certainly not in a coffeehouse, where I go to escape from myself. Yet it is here that I find myself confronted with myself and my kind. I find myself insupportable, and even more insupportable is a whole horde of writers and brooders like myself. I avoid literature whenever possible, because whenever possible I avoid myself, and so when I am in Vienna I have to forbid myself to visit the coffeehouses, or at least I have to be careful not to visit a so-called literary coffeehouse under any circumstances whatever. However, suffering as I do from the coffeehouse disease, I feel an unremitting compulsion to visit some literary coffeehouse or another, even though everything within me rebels against the idea. Of Bernhard’s commandingly assertive diatribes against existence, the only real content is their existence as liberating acts of self-cancellation and exaggeration. Bernhard’s own project was to rehearse not only every possible Bernhard thought but also every possible Bernhard counterthought, acknowledging that we are mistaken if we believe we are in possession of the truth, just as we are mistaken if we believe we are in error. Bernhard’s preoccupation with death and suicide and the absolute meaninglessness of existence—it is the energy generated by his fervent determination to overcome them that makes Bernhard’s literature the most life-affirming literature of all. Impatient to consume Frost, I had thought that going to the Bernhard house was a trivial substitute. But that visit added to my so-called understanding of Bernhard much more than reading Frost ultimately did. Frost’s setting already displays signature Bernhard trappings that would appear again and again—a godforsaken valley whose every molecule is fouled by a cellulose factory, where the inn is tainted by a notorious murder. More crucially, it posits Bernhard’s fundamental theme of the futility of language in the face of pitiless nature, which for him mainly comprises illness and human cruelty. (Nature was Thomas’s problem, as Dr. Fabjan said of his brother.) But Frost finds him only groping toward the stylistic breakthroughs that would permit him to carry out, in writing, his struggle for and against life. Life was like a forest: you kept finding signposts and markers until, all at once, there weren’t any. And the forest is never-ending and hunger ends only with death. And you keep walking through clearings, you can never see past those clearings. “The universe can feel oddly constricting, under certain circumstances.” But to show someone the way to where he was now, if the person who didn’t happen to know it already himself, that was something he was no longer prepared to do. “I work with my own notions, elaborated by myself out of chaos.” One would have to understand what he meant by “bitterness,” by “fundamentally,” by “light” and “shade,” and “poverty tout court.” But who understood. Bernhard would dramatically reverse this arrangement halfway through Gargoyles (its German title literally means “disturbance”), his second full-length novel, published in 1967. A doctor takes his son on his rounds, visiting an array of rural grotesques. But when they meet Prince Saurau in his castle, his solitary, stationary mind takes over the rest of the novel in an uninterrupted paragraph. The furious action is purely verbal, completing the stylistic formation of his art of exaggeration. And yet the more time I spent anywhere in Austria, the more I understood that Bernhard’s renunciation of the external landscape was no less subject to correction than any of his other declarations. As Bernhard did, his narrators chronically seek to escape the forbidding climes of Austria for Rome, Madrid, or Lisbon. They turn their backs on Austria forever, but their inevitable forced return, usually occasioned by an untimely death, reveals that their interior landscape, and Bernhard’s, remain Austria. Tucked into the frame of his bedroom mirror are crumbling bus tickets collected in Portugal, Italy, and elsewhere on his Mediterranean journeys, as well as on one trip to New York—the house’s sole gesture toward the non-Austrian world. Bernhard notably did not actually make himself at home anywhere else. Indeed, he never fully learned another language, because, Dr. Fabjan said, he did not wish to be influenced by a foreign culture. And so for my work—everyone has his needs—it is supremely important to be in a country whose language I do not understand, because I always have the sensation that people are saying only pleasant things and speaking only of important, philosophical things. Whereas when you’re at home and understand the language, you feel that people are saying only absolute nonsense, no? Thus the nonsense, in Spanish, becomes philosophical for me. Bernhard’s southern havens also happen to be the foreign countries where his work enjoys the widest reception. They are Catholic peasant societies where readers, like Austrians, can recognize the mental effects of an actual state and society in what may strike Americans primarily as a kind of existential grotesque. Dr. Fabjan, who treated us like dignitaries from an unknown world of American Bernhard readers, noted that Bernhard’s plays have found little exposure among English-speakers, who find that they sound just like Samuel Beckett and think, We already have this, what do we need this for? After closing up the house and pouring us some cider from the cellar, Dr. Fabjan drove us back to Gmunden. He discussed the work of preserving his brother’s literary estate. He did not address Bernhard’s notorious prohibition in his will against the publication or performance of his works in Austria for the duration of their copyright, or his own decision to ease that ban. He noted that a German institution had made a handsome bid to buy Bernhard’s papers, but that he had refused to consign them to a foreign country. Musing on the differences between Germans and Austrians, Dr. Fabjan noted Bernhard’s use of distinctively Austrian words whose significance was lost on other German readers—such as Semmering, a summer resort with instant social connotations within Viennese society, where Bernhard frequently stayed with Stavianicek. Thomas, Dr. Fabjan concluded, as the Jaguar glided through the cornfields and through the forest, was a typical Austrian writer. Again, a few blunt words that Bernhard himself could easily have declared, but that I had to travel to his house to realize were true. Later, re-reading Bernhard’s memoir A Child, I realized what had been so dramatic about the sight of the bicycle in the cow-stall. Bernhard recounted, in the book’s gripping opening, how he had impulsively jumped on his guardian’s precious Steyr-Waffen bicycle for the first time at the age of eight, and set off, without telling anyone, to find his aunt’s house, more than twenty miles away in Salzburg. Pedaling euphorically, he longed for his family to witness his triumph. But the reality of the punishment in store for him set in—less the whipping by his mother than the caustic reminders that he was an unwanted child by a scoundrel father: You were all I needed! But he revived at the prospect of recounting his feat to his only idol—his grandfather Johannes Freumblicher, an anarchist and writer. He prepared a highly dramatic account of undoubted truth, even as he added exaggerations designed to lend it spice, or fresh inventions, not to say lies, and succeeded at convincing his grandfather of his heroism. The bicycle, Dr. Fabjan later confirmed, was the one standing in the cow-stall. And that primal drama of perseverance, punishment, and the power of words was the same struggle that Thomas waged over and over in his writing: to overcome the constraints into which he was born, as a human being, and as an Austrian, and survive through language.